MPDB Series Open-Style Power Distribution Blocks provide a safe and easy method of splicing cables, splitting primary power into secondary circuits and fulfilling requirements for fixed junction tap-off points. All blocks are UL and CSA approved while meeting spacing requirements for feeder and branch circuits in conjunction with UL508A and the National Electrical Code®. PDB options include single or dual conductor primary inputs and up to 30 secondary outputs. 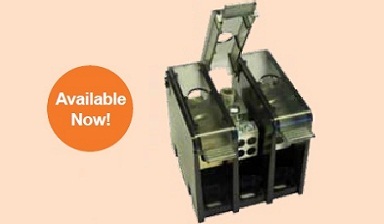 Specialty blocks are available allowing for up to 7 primary inputs. The MPDB series is offered in three size categories: miniature (MPDB62 and MPDB63 series), intermediate (MPDB66 and MPDB67 series), and large (MPDB68 and MPDB69 series), in both aluminum and copper. The MPDB double-wide series are designed for custom applications where large ampacities are required. Double-wide blocks are not UL or CSA certified unless otherwise notice. All double-wide blocks are Mersen self-certified and approved. Download the MPDB Series Open-Style Power Distribution Blocks spec sheet below or call 714.835.6211 for more information.